The 3rd hole of the South Course at Torrey Pines. Plan your next trip with our new Dream Weekend series, which gives you the best recommendations for golf courses, hotels, restaurants, and sightseeing--so you can focus on your round instead of your itinerary. Now on the tee: San Diego. Widely known as the epicenter of the universe when it comes to golf equipment companies, San Diego earns serious props from tourists and golf purists alike for its enticingly temperate climate, its plethora of public-access PGA Tour tracks and its dazzling array of off-course attractions. Drive 40 minutes north from San Diego International Airport via CA-163 and 1-15 to play Maderas Golf Club ($140-$210; maderasgolf.com), a Troon-managed facility that wows with superb conditioning, service and clubhouse, as well as with an inland layout studded with oaks, creeks, rock outcroppings and environmentally sensitive areas. The canyon-laced stretch of holes 14 through 17 combine beauty and brawn unlike any other in the region. Value alternative: Coronado Municipal Golf Course ($53-$58; golfcoronado.com) might numb you for the glacially slow pace of play, but for its price tag, it’s worth the waiting time, thanks to easily walkable holes that sport memorable views of Navy ships, a marina, the San Diego-Coronado Bridge and the San Diego Bay itself. Check into the Craftsman-style Lodge at Torrey Pines in La Jolla (weekend rates from $369 per night; lodgetorreypines.com), which features views of the Pacific and unparalleled visitor access to Torrey Pines’ municipal golf courses. Head straight to The Grill and sample a local craft beer or two around a fire pit. Al fresco dining at the Lodge at Torrey Pines’ A.R. Valentien offers views of the South Course’s par-5 closing hole, but better you should enjoy chef Jeff Jackson’s emphasis on fresh, local ingredients indoors—the main timbered room is that attractive, complete with period artwork on the walls. Alternative Lodging: If you’d rather be free of the (possible) coastal fog, move a few miles inland to either the Omni La Costa Resort & Spa (omnihotels.com) in Carslbad—its spa is world famous—or at the Fairmont Grand Del Mar (fairmont.com/san-diego/), with its Addison restaurant, ranked among California’s best. Harry’s Coffee Shop (harryscoffeeshop.com) on Girard Street, has been a La Jolla institution since 1960. For local conversation and breakfast basics done right, start your day here. The B.W. Benny, a waffle which includes ham, bacon, poached eggs and hollandaise sauce, is especially fortifying. 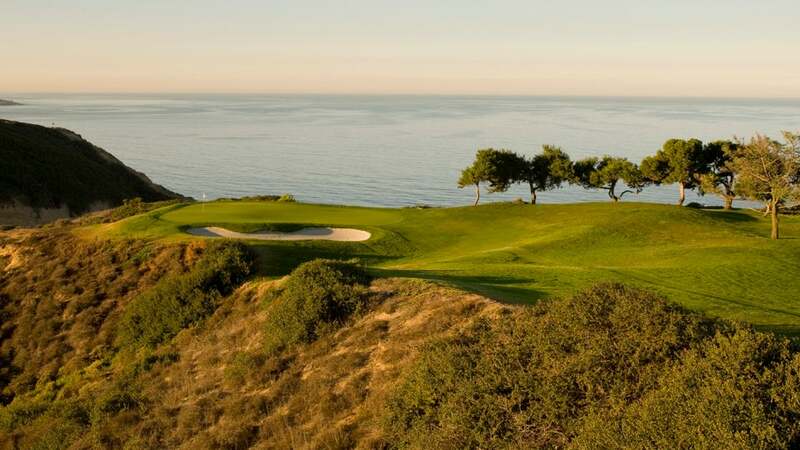 Torrey Pines’ legendary South course ($110-$272; torreypinesgolfcourse.com) is on tap, so bring your muscles and your A-game. Rees Jones re-designed this municipally-owned tract in 2001 and today it stretches more than 7,600 yards. It plays even longer, thanks to breezes and frequently heavy air, due to its cliff-top location next to the Pacific Ocean. Host to the PGA Tour’s Farmers Insurance Open, an event that Tiger Woods has captured seven times, it also played host to the 2008 U.S. Open, when Woods overcame the scrub-choked canyon holes and a broken leg to claim the title. The U.S. Open returns here in 2021. Both the young and the young at heart will warm to the world-famous San Diego Zoo (sandiegozoo.org), a hilly, sprawling spread in Balboa Park, near downtown. Habitats for the animal exhibits are renowned for how seamlessly they mimic nature itself. While the quality and quantity of the inhabitants will amuse and astonish, there’s no question that Panda-monium reigns. Seaside alternative: Whale-watching on a 138-foot, America’s Cup sailing yacht replica is stock-in-trade at Next Level Sailing (nextlevelsailing.com). Golf alternative: Torrey Pines’ North course ($100-$168; torreypinesgolfcourse.com) has long served as co-host at the PGA Tour’s Farmers Insurance Open, but generally took a backseat to its brawnier sibling, the South, even as it was the more scenic of the two. Following a recent Tom Weiskopf renovation, however, the North shines with new luster. All 18 greens were rebuilt, all fairway bunkers were reconstructed and more tee boxes were established for increased flexibility and variety. The stellar ocean views remain intact. George’s at the Cove (georgesathecove.com) in La Jolla combines innovative California cuisine with million-dollar ocean views. Gourmet fare at California Modern, cocktails at Level 2 and the rooftop Ocean Terrace are equally enticing in their own way. The Marinated and Grilled Fresh Fish Tacos, made with heirloom corn tortillas is a standout starter. La Jolla’s venerable 90-year-old La Valencia Hotel (lavalencia.com) is perched above the Pacific and there’s no better way to absorb its charms than by ordering breakfast at THE MED. High above the sea on the seventh floor, THE MED offers three choices, a casual patio, a main dining room and an ocean-view terrace—all worthy. Order the La Jolla Omelete, a remarkable concoction of blue crab, arugula, goat cheese and sundried tomato, and you’ll greet the rest of the day with a satisfied smile. Few resorts anywhere offer such a substantial PGA Tour legacy as the Omni La Costa Resort & Spa, so before you leave town, take on either of the property’s two courses, Champions or Legends. Each is open to public play on an every other day basis. Both have witnessed tournament-winning walks from Jack Nicklaus to Gary Player to Lee Trevino to Tom Watson and Phil Mickelson. Without question, however, the most memorable clinching shot was struck on the watery par-3 16th hole of the Champions Course, when Tiger Woods nearly made an ace on his way to downing Tom Lehman to win the 1997 Tournament of Champions in a playoff. Champions is the longer, stronger, slightly more scenic of the two, so play that one if you can.